The schedule, as well as information and updates during the 2018 Joint Annual Conference will also be available via the free Guidebook mobile app. Download the app here. If you already have the app, search "2018 Joint Annual Conference" to download the guide. Download the detailed schedule here. 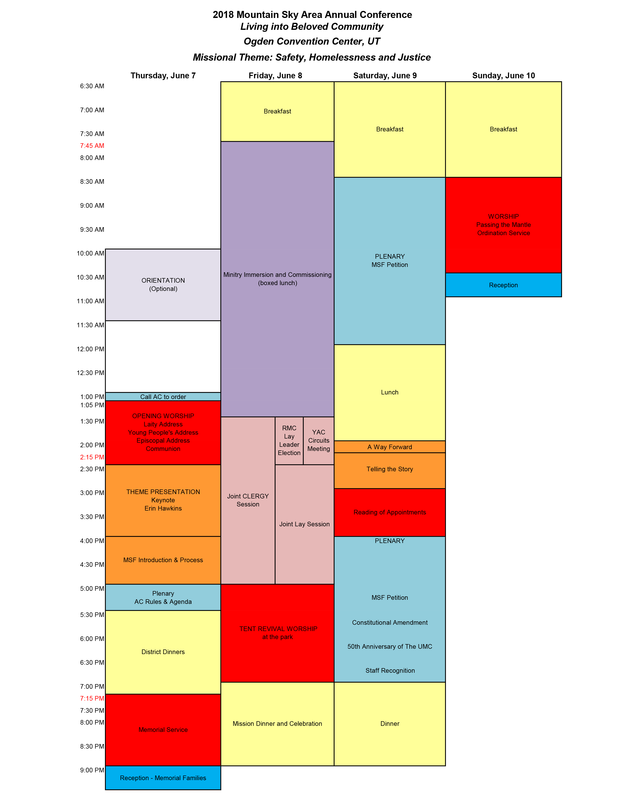 Download a PDF of the conference block schedule here. Please note this schedule will be updated regularly. Questions regarding Annual Conference may be directed to the Mountain Sky Area Program & Arrangements Co-chairs: Rev. Rob White, rob.white@fumccr.org or Rev. Tyler Amundson, tyler.amundson@yacumc.org.